We love inviting new families like yours to consider joining our musical family. Simply provide us contact information for friends that you think would enjoy the opportunity to discover, learn, and play music at DSM. We will personally reach out to them and extend an invitation to attend an upcoming open house where they can learn about our various programs and activities in addition to meeting our faculty. If a friend enrolls you will receive a 10% tuition appreciation discount on your next enrollment! 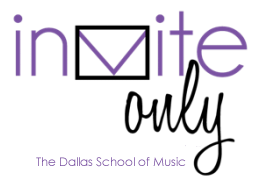 Thank you for introducing your friends to The Dallas School of Music.